Jon Brady believes Jefferson Louis could be the man to fire Brackley Town into the Blue Square Bet North play-offs this season. Boss Brady last week swooped to bring Louis back to St James’ Park, after the striker left Newport County. The hitman was prolific for Brackley last season, scoring 18 goals to help lay the foundations for Southern League Premier Division glory. He did enough to earn a move to Blue Square Bet Premier side Lincoln City midway through that season, before clinching a deal at Newport during the summer. But the Welsh side stopped one game short of triggering a clause in Louis’ contract which would have seen him sign a permanent deal. Brady wasted no time in making his move to bring the frontman back to Brackley, signing him on a deal until the end of the year. And Louis proved the catalyst for a 3-0 win at Droylsden last weekend, scoring and putting in a fine performance in his first game back. “We had been creating chances but not been taking them and I felt we needed a freshness up front, which is why I brought Jefferson back,” said Brady. “He scored loads of goals for Lincoln and set the world on fire at Newport at the start of the season but they didn’t want to trigger his contract and the boss stopped playing him. “I was monitoring the situation and brought him back. There are no hard feelings about how he left, because it’s a no-brainer to take a move to a higher level. Louis and two goals from wing wizard Tom Winters secured the victory in Greater Manchester last Saturday as Brackley got back to winning ways following five games without a win. They will now be looking to build on that when Bradford Park Avenue come calling this weekend, but Brady knows his side will face the toughest of tests. “They got a draw against (league leaders) Chester last weekend and our game up there was one of the toughest games we’ve had,” he said. Darran Foster admits he is surprised to see Saturday’s opponents Northwood langushing in the lower reaches of the Evo-Stik Southern League Division One Central. Daventry travel to Middlesex as hot favourites to claim a league double over Northwood, who were beaten 1-0 when the sides met at Communications Park back in September. But Foster will be warning his players they may be in for a tougher than anticipated test. “I find it strange they are struggling, because when we played them at home in September and beat them 1-0 they were one of the best sides we have played,” admitted Foster. “They were a young side, very attacking, but as the season has gone on they have lost a couple of players, and they seem to be really struggling now. “So what to expect from them, I don’t know. “What we will do is attack the game as we do every other game, it doesn’t matter if we are playing a team at the top of the league or the bottom of the league. Foster has set his side a target of nine points out of nine from their next three games against Northwood, Leighton and North Greenford, who are all in the bottom seven. The Town boss feels there is no room for error after watching his side drop two points as they drew 0-0 with Aylesbury on Tuesday night. That result came hot on the heels of Saturday’s 4-2 win over Royston, and was a frustration for Foster. “We battered Aylesbury,” said the Daventry boss. “We have hit the woodwork three times, we have missed a penalty again. “We have missed three one-on-ones and their goalkeeper has had the game of his lifetime. “The performance again was exceptional, and the commitment was there. We did everything we could do, but Aylesbury just camped in their 18-yard box in the second half and we couldn’t find the finishing touch. “Scoring goals has been a problem for a while, but we just have to keep plugging away. As well as missing a hatful of chances in open play, Daventry also missed a penalty - having missed two against Royston. Robbie Brown was the guilty party on both occasions on Saturday, with skipper Guy Sanders missing against Aylesbury. “Jamie Gould is my normal penalty taker, but he has been on the bench the past two games,” said Foster. “He hasn’t missed a penalty all season, and I thought about bringing him on as a special kicker! Pete Harris says Woodford United will go into this weekend’s clash with Slough with a positive attitude – despite suffering a 7-0 defeat at Burnham on Tuesday. The Reds were 6-0 down at half-time at The Gore, but stemmed the tide in the second half, only conceding one more goal. And joint boss Harris insists his side, who are bottom of the Southern League Division One Central, can take some positives out of the game ahead of the home encounter with Slough. “We’re going into it with a positive attitude,” he said. “We know Slough are a tough side but you never know what happens, we could nick a point or three. Chris Plummer has challenged his Corby Town side to play every game as if they are up against a team at the top of the Blue Square Bet North table. The Steelmen boss was delighted with his players’ efforts as they gave second-placed Guiseley a fright up in Yorkshire on Tuesday night. Corby took the lead through top scorer Josh Moreman before the hosts fought back in the second half to claim a narrow 2-1 victory. And while Plummer admitted he was slightly frustrated by the final scoreline, he believes the performance shows just how much progress has been made over the past few months. “I guess there is an element of frustration to go that close to getting a great result up there and people may say that we might as well have lost 5-0 because you only get the same number of points for a defeat,” the Corby boss said. “But I was very pleased with how we matched up to one of the top sides in the division just like we did against the leaders (Chester) not that long ago. “I do believe we are a better side than the table suggests but what we have to do now is put in those performances on a regular basis. Plummer’s side are back on the road this weekend when they head to in-form Stalybridge Celtic. And he is backing Moreman to get back on a scoring run after his goal on Tuesday night ended a month-long drought for the striker who now has 15 to his name in all competitions. “It was good to see Josh back on the mark and it was a good goal as well,” Plummer added. “He has had a bit of a lean spell in front of goal but he has had a suspension and an injury in that time. Plummer confirmed he is set to welcome back captain Jason Crowe from injury for Saturday’s trip after he missed Tuesday’s game and last weekend’s 0-0 home draw with Histon. There aren’t many outside their four walls who will give Kettering Town much chance of a great escape from relegation this season, despite the recent revival. But Poppies assistant-manager Thomas Baillie has targets in mind as he and boss Alan Doyle plot the most unlikeliest of success stories for a club that has been down to the depths over the past few months. Make no mistake, the off-field problems haven’t gone away. The Poppies’ long-term future still lies in the hands of majority shareholder Imraan Ladak, who is still choosing to maintain a deafening silence, and the fact the club remains tied to a lease at Nene Park even though the Irthlingborough venue hasn’t been used for over three months. However, with Ritchie Jeune and his volunteers keeping the club alive by securing a ground share at Corby Town’s Steel Park stadium, the focus has been turned back to on-field matters, for the time being at least. And it has proved to be a fruitful period for the Poppies. A new squad thrown together on funds, which are a far cry from the better times under Ladak, have given the club just a little sniff of getting out of trouble. They are 13 points behind Hitchin Town – a gap that was more than 20 just a few weeks ago – and while they suffered a setback in last weekend’s 5-2 defeat at Evo-Stik Southern League leaders Hemel Hempstead Town last weekend, Baillie has a quiet confidence about him. A tough month continues when another of the high-fliers, Stourbridge, come to Steel Park on Saturday. But Baillie knows what he wants by the time January is done and dusted. “It is a big month coming up with some very tough games,” the assistant-manager said. “But I have said it already. If we can get that gap down to nine or 10 points by the end of January then I think we will be happy. The Poppies boosted their ranks this week with much-travelled striker Jason Turner re-joining the club for a second spell while Nathan Fox has signed on loan for the rest of the season from Corby. Victor Kemjika, who made one substitute appearance for the Poppies last season, has also signed and is awaiting international clearance. And Baillie believes the continued development of the club in the future must have a local feel to it. 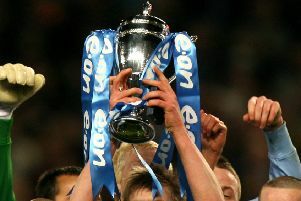 “We are trying to get the town believing in the club again,” he added. “No-one is ducking out of the way of the big issues. But we can only do what we can do and with someone like Jason coming back, it strikes the right chord. “He is a local boy playing for his local team again. “We have a lot of players from the local area and when we bring players in we want them to be from the area.